Had a really harrowing experience today. I was conflicted about posting this, but figured it could help more people than do harm. Today, my father had an accident at Cheras. His tire burst and he lost control of his car. Luckily, he only hit one car with minimum damage to the other persons car, and nobody was hurt. 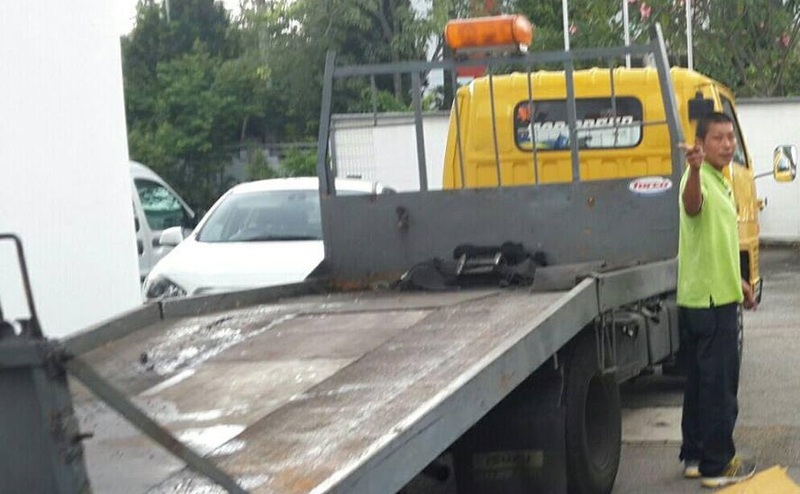 He called his car workshop (Renault) and they said it would take a while for their tow-truck to arrive at the scene. There was another tow-truck present (the ones that usually show up in an accident), and the police kept pressuring my father to move the car out as it was causing a traffic jam. My father called Renault again, and they talked to the other tow-truck. Finally, my father negotiated with them that they would take the car to the police station for RM 200. They insisted he sign a document that would allow them to move his car with permission, otherwise if they were stopped by the police they could get in trouble. Of course, in hindsight this was not a good move, but in the stress of the moment (with the police pressuring him to move and the narrow escape from death lingering on his mind), he signed the document. Once he reached the police station, his employee (who was there at the accident and had gone with the tow-truck) called to tell my father that the tow-truck was taking the car to their workshop. My dad called them and told them to bring the car to the police station as agreed, but was told that they were going to keep the car unless he paid them. 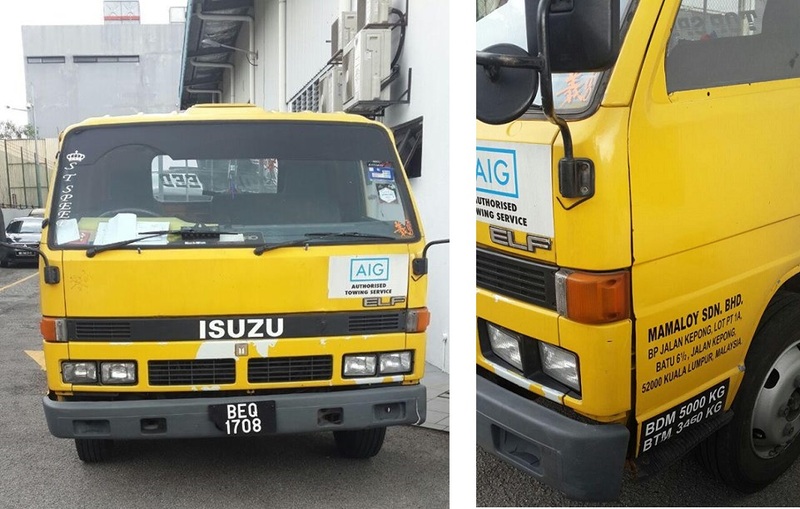 When the tow-truck came to the police station they came with 10 workers, and threatened my father that either he pay them RM 2000 or else they wouldn’t return the car to him. My father turned to the sergeant and asked for help, but the sergeant told him that since he signed the consent form he could not be helped. They verbally abused my father at the police station and the police did nothing. My father was then forced to withdraw RM 2050 and pay the tow-truck people that amount to take the car to the Renault workshop. I met my dad at the Renault workshop to pick him up, only finding out about what happened with the tow-truck there. So I quietly took photos of the tow-truck and the man whilst they unloaded the car. After unloading the car, the man demanded my father pay him rm 200 for “helping to drop the car”. My dad of course got angry that they kept trying to take money from him, when he had already paid such a large sum and had seen this man take money from the cash he had withdrawn. The guy got angry, went to his truck and took out a rod. Then he ran after my dad with the rod, with me running behind him to stop him. As I was running I threatened that I would take a video and call the police and use it as evidence. Then the man turned to me and knocked my glasses off. He started threatening me, so my father ran towards us to protect me. The man tried to the attack us again, but this time the security guard and my dads employee restrained him and I restrained my dad. I told the man that I was calling the police, and dialled the Shah Alam police. The man went off to call his boss. With shaking hands, I waited for the police pick up but nobody did. Luckily, it seemed that the boss told the man to just go, and he left. I am so disappointed and shaken by how these people and the police acted. Please everyone, no matter how pressured you feel or what the police tells you, do not go with any of these vultures if you ever have an accident!! They will not only take your money, but they are very willing to cause bodily harm! This post is written by Zia Shah and is widely shared on social media.